The High Speed Train (HST), backbone of rail services through the Thames Valley and beyond, is celebrating its 30th birthday carrying fare-paying passengers. Europe's first high speed rail service was inaugurated at 0805 BST on 4 October 1976. At first the trains just ran through the Thames Valley between London and Bristol. 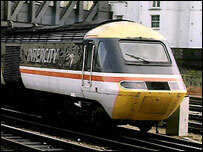 But the Inter City 125s, as they became known, at one stage dominated long distance services from the north of Scotland and as far south as Bournemouth and Southampton on the South Coast. This year's anniversary passed off with as little ceremony as the running of the first timetabled train itself. Back then, many passengers did not even realise they were travelling on a record-breaking service, although the Inter City 125 was an immediate hit with the fare-paying public. British Rail was quick to capitalise on its popularity and the High Speed Train appeared in a string of TV commercials for the network fronted by Jimmy Savile who told passengers that "this is the age of the train". In fact the HST's life was never expected to be this long. The train was expected to be replaced by a new generation of tilting Advanced Passenger Trains. But they were dogged by technical problems and the British design was finally scrapped on the orders of the government in the 1980s. When it first appeared, the HST was revolutionary - and not just because of its speed. The traditional locomotive was replaced by a streamlined power car at each end - one pushing and one pulling it along. Passengers were treated to air conditioning with automatic doors between the carriages. Gary Heelas, chairman of the 125 group, which wants to preserve one of the trains when they are finally withdrawn, said: "I think it's an icon. You have to look at it in the same breath as Concorde." The HSTs will not be passing into history any time soon though. First Great Western and GNER, the main operators of the trains, have just begun putting new engines into the trains - their biggest revamp in three decades. Built in Germany, the new engines are said to be greener, using less fuel and creating less smoke. Government and the rail industry are still in discussion about a replacement. 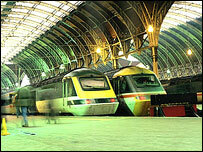 But plans remain at an early stage with the HST still expected to be in use when its 40th birthday rolls around. Graham Boot Hanford, a veteran of BR responsible for keeping the trains running on services between London, Wales and the West Country, said: "Considering each one does a quarter of a million miles a year they've lasted remarkably well and they're still considered the standard to beat for all new trains."